We stopped at the estate sale on a whim. A friend and I had just spent the afternoon on a rainy hike. The dog was sacked out in the back seat. A hot bath and nap waited at home, but a sign to the estate sale beckoned from the main road. "Do you want to stop in? It should only take a minute," I said, fibbing just a little. My friend was a good sport and pulled over in front of the modest house. Since it was late on Sunday, pickings were slim. The remaining furniture and lamps showed a grandmotherly house that had its last major redecorating in the early 1960s. A card table held a dented cocktail shaker and some gold-rimmed highball glasses. A box of greeting cards, used, sat on a coffee table. Some were written in blue fountain pen that had started to fade to brown. Two partially-full boxes of spiral incense from Japan kept recipe booklets company on an end table. Hanging on a bedroom door was a full Shriner's outfit, from booties to cap. All this was intriguing fodder for the imagination. (Did she travel to Japan at some point and bring back incense, then discover she couldn't get the darned things to stay lit? Did she throw the cocktail shaker at her randy brother-in-law and that's why it's banged up? Did her husband die in a freakish fraternal lodge-related incident involving miniature cars?) But it wasn't why I came to the sale. Then I found it: a quarter ounce of Lucien Lelong Indiscret extrait. Bingo. Better yet, it was only four dollars. Jean Carles, author of the classics Dana Tabu, Carven Ma Griffe, and Schiaparelli Shocking, created Indiscret in 1935. My guess is the bottle I bought — flat, octagonal, with gold cap and rubber stopper — was from the 1950s. On skin it smelled spicy, woody, powdery, and floral and was reminiscent of Millot Crêpe de Chine, but with a definite clove note. Its floral heart was tight and seamlessly blended, giving the shape rather than the distinct fragrance of jasmine, ylang ylang, carnations, and other flowers I can't suss out. As Indiscret warmed, a little musk showed itself, but the incensey wood stayed strong. It smelled old fashioned the way Ava Gardner was old fashioned. What kind of woman was the owner of the house that she chose Indiscret? Was she as mysterious and elegant as the fragrance? From looking at the remains of the estate sale, I would have pegged her as a Caron Fleurs de Rocailles sort of gal. Clutching my bottle of perfume, I moved on to the kitchen to search — in vain, as always — for a Le Creuset Dutch oven. While I scanned the piles of cake pans and plates for Le Creuset's telltale flame enamel, my friend called me over. "Look at this," she said. She'd found a black and white, deckle-edged photo of a woman standing in front of the house. "It must be the owner." She wore a light-colored Katherine Hepburn-style pants suit and a small hat perched on the side of her head. She was tiny-waisted and curly-haired and smiled broadly. It looked like it was taken in the 1940s, just after the house was built. Besides the Indiscret, I went home with a box of the spiral incense; a packet of notepaper shaped like a long hand with red fingernails, with "a longhand note" inscribed at the top; and a linen napkin cross-stitched with "Go, I Dare You!" and an old-fashioned car. But I wish I'd bought the photograph of the house's owner. I'd like to look at it again. I'd like to examine her more closely for traces of Indiscret. Lucien Lelong Indiscret was discontinued, then reissued in the late 1990s as what the Lucien Lelong website describes as a "complex fruity floral". If anyone can comment on what the current formulation smells like, please do! As always, a wonderful article. You find the best stuff! I like your speculation about the shaker. I found a valise at the thrift store a long time ago, the kind with the little glass bottles and brush and everything in it. Also in it was a photo of a smiling couple obviously on vacation. I eventually passed along the valise, but kept the photo. I love looking at pictures like that, wondering what they were like. Isn’t it fun? Looking at the remains of other people’s lives and wondering? In some ways it’s inspiring, too. We only have so long on this planet, might as well make the most of it. What imaginative writing, this was a pleasure to read! I smelled Indiscret @ the Saks Fifth Ave outlet store about 5 years ago (Off Fifth? I think is the name). It was a sister to the original formulation of Opium, carnation, soft woods, clove and musk. If that’s what the reformulation smells like, then it sounds like it’s pretty close to the original! I have several small decants of vintage Lelong fragrances [Sirocco, Tailspin and Indiscreet] as well as a decant of the current Pour Femme, and since I’m a fan I couldn’t wait to read your thoughts about this fragrance. But as usual, I was captivated by your storytelling. And when I got to the part about your search for a Le Crueset Dutch oven, I had to smile. I always hope to find a vintage one at a good price and dread that I will just have to resign myself to fork over the big bucks for a new one. Anyway – great story and great score! Confession: after I submitted this post to Robin, we had an email discussion about Le Creuset, and I ended up driving to the outlet yesterday and buying a 7.25 quart dutch oven! For some reason, everything kiwi is discounted 30% over the outlet prices this month (Dijon is 25% off), so I have a big, gorgeous kiwi-colored dutch oven just itchin’ for a braise. That’s awesome Angela! The kiwi color is so cool – the dijon would work too. But I really love the orange one [flame?]. I need a Le Crueset outlet! The flame color feels so old fashioned to me that I love it, but it would have cost about $70 more. So it was kiwi for me! There are Le Creuset outlets all over out there. Maybe there’s one not too far from you. I checked…there is NOT one near me. I will blame you for all the hours I spend in TJ Maxx this month, looking for a dutch oven! Well, shoot. You’ll have to come visit me, then, and we’ll drive to the outlet together! Can you tell me how Tailspin and Sirocco stack up to Indescrit? I am about to buy the later mentioned perfume. I haven’t smelled either of them, in vintage or newer formulations, so I can’t say. I sure like the bottles, though. Your story calls to mind some of the houses I see on “House Hunters” and other shows like it on HGTV. The (usually) young couple go from house to house looking for the most updated kitchen, bath, floors, etc. but turn up their noses at a perfectly preserved ’50s black and white tile bathroom or a red-tile/yellow cabineted, Spanish country style kitchen from the ’40s. I love these people who don’t feel total gutting and redesign to be necessary. It leaves behind a wonderful time capsule, such as you witnessed. I am quite a history/nostalgia though, so I know I’m in the minority. I meant to say “history nostalgia buff”. Sorry. You get the picture. I totally get the picture. Don’t worry about typos–they’re impossible to avoid. I love a nicely preserved interior, too. I don’t feel the need for a dishwasher or microwave, so a small, simple kitchen is perfect for me. Bring on the old tile and cool faucets! You would have loved the old Palo Alto apartment I once lived in: kitchen counters were tiled in lemon yellow four-inch squares set diamondwise, with turquoise rectangular trim. Loved the look of it, but sorely missed having a dishwasher. Lemon yellow and turquoise! I love it. I don’t have a dishwasher, but I never have. People tell me once you have one, there’s no going back. But until then…. The look on the guy’s face at the appliance store when I told him I didn’t want a microwave (we were doing the whole kitchen at one go)! I definitely wanted a dishwasher though. I never thought to look for perfume at an estate sale…or even a garage sale, only kitchen stuff. Must alter that thinking. I love looking for kitchen things, too, but do look for perfume. I’ve found some interesting things at good prices. I am drooling! Sounds dreamy to me. Actually I’ve been with and without a dishwasher and if it’s just me, I don’t miss one. But I live with an incredibly messy sister and it is unfortunately necessary in my household now. I would think that or babies who need extra clean bottles would be good reasons for a dishwasher. I’m of two minds on this subject. I love 30’s, 40’s and 50’s design, and if I bought a house with, say, a 50’s style kitchen or bathroom I would probably love it. My 70’s era house, on the other hand, was a little too 70’s when I bought it. I love the exterior, the floor plan, and the dark wood cabinets in the bathrooms and kitchen and paneling in the living room. I just ignore all those people who tell me dark paneling is “dated”. I didn’t waste much time, though, in getting rid of some of the truly hideous wallpaper (the laundry room wallpaper was plaid!) It was a relief, as wll, when the harvest gold stove in my kitchen finally died last year, and I could get a new stove (stainless steel) with a clear conscience. I have a really hard time replacing things that still work, no matter how dated and ugly they are, but I really HATE harvest gold (and avocado green)! Plaid wallpaper! Yikes! Yes, as much as I love a house that has its own character set in time, I’d have a hard time living in a 1970s house. But I think I’d face the same dilemma you have: I wouldn’t want to toss out perfectly good appliances, even if they were harvest gold. Thank goodness that stove finally died! I lived with a harvest gold refrigerator with a fake wood-paneled handle for a few years. It had its own freaky chic, but I breathed a sigh of relief when it died and I could buy a new, white one. I draw the line at 70’s decor. Harvest gold and avocado are high on my list of Things I Do Not Want! I did see a kitchen that a woman had done in avocado- it actually wasn’t half bad.But definitely not my cup of tea.But plaid? Who uses plaid as wallpaper outside a gathering of the clans? To each her own. I’m fond of the 40’s and 50’s decor myself. I’m still an apartment dweller, but (soon) when I go house hunting I hope I can find my dream house. I think Nashville has a good supply of houses I might like. Although it’s probably expecting too much to find a kitchen with a Chambers stove. That will be purchased if it hairlips a duck! Good luck! I have a feeling you’ll find a great house–that, or you’ll take an o.k. house and make it great. My house had a 1980s Montgomery Ward stove when I moved in. After two burners and the oven element pooped out, I bought a 1957 GE Mainliner stove. It’s extra wide and has two ovens and fits the space perfectly. Then I discovered that the house two doors down, with the same floorplan as mine, has the exact same stove. I know what you mean about ’70s decor, although I have seen some designers who take actual furniture and appliances from the ’70s and incorporate them in with more modern decor and they make that avocado ‘fridge look pretty spectacular. My sister and I dream of buying back our childhood home but little does she know I would plot to redo the basement in the original wood panelling and orange & red shag carpet! Don’t forget the mirrored wall tiles! And maybe one of those tapestries with a stag standing on a hill and the sun rising in the horizon. It’s mid-century modern all the way for me, as it was for my mom. She hated that 70’s gold-avocado-rust palette, so I’ve never had to live with it. I’m sure that saved you several years of therapy! I know what you mean about HGTV. So many times I’ve looked at the finished product and cringed internally. They ripped out that lovely kitchen/bathroom etc,. and installed a refugee from a hotel design school? Ughh. I think I might start looking for retro perfumes at estate sales just on sheer principle. Lots of designs and time capsule houses from the 20’s through 50’s. Just beware. That renovation site can pull you in and somehow several hours of your time mysteriously disappear. The time sink has already begun. I think I have found my people…. Ohhhh! Thanks for the links, Marsha! Off to disappear downt the retro-deisgn rabbit hole for awhile. Marsha, those sites are a godsend. Thanks! Ordinary lives usually *are* special and mysterious! This probably happens to you, too: people tell me strange things seem to happen to me a lot. It’s not true. It’s just that I pay attention (sometimes) to regular things. So sad about losing part of your Le Creuset set! Heartbreaking. You could have left them to your kids. On the subject of stutterers, wasn’t The King’s Speech playwright’s Oscar acceptance speech terrific? It was graceful, generous, and seemed heartfelt. He was one of the top highlights of the show, in my opinion. Le Creuset, perfume, old photos and Shriners’ outfits! Angela, you’re the best! This was wonderful. I’m glad you liked it. Aren’t the images great? I like the ad on the left, especially. It’s just like someone stepping into an estate sale. Yes, but the images you paint with your words are even better! Fabulous as always, Angela. I love the all the speculation particularly the demise of the Shriner! I too am fascinated by the past- old houses particularly and doors especially- what have they heard? what have they been closed against? Trysts, plots, mundane conversation, laughter… Were they slammed? Flung open in expectation? I read a short story as a child that has always stuck with ‘me (and I so wish I could remember the author so I could track it down ) where an old building, a school I think was demolished and all of the sounds it had ever heard were released into the air, filling it with conversation, giggles, songs, crying, noises of life. I love the story about the sounds of a school being released into the air, too. There’s something about old things that intrigues me so much. I drove to an outlet mall yesterday, and I just couldn’t understand all the people thronged at the stores–for new things. Where are the stories? And I always love the chairs – what have they witnessed? The short story sounds like it could have been written by Ray Bradbury. My mother wore Shocking until she couldn’t get it anymore and then switched to Ma Griffe – I wonder if she knew the same perfumer made them? Chairs! Yes, especially the favorite chairs, the chairs that were the daily sitting places for reading or knitting or whatever. Did your mother like Miss Dior, too? Jean Carles was co-author of that one. I LOVE old chairs! I have a couple of original Art Deco chairs. Wouldn’t have a new chair if you gave it to me! Another lovely find for you, and a great report for us. Thanks, Angela! You’re welcome! I think I’m coming across as a braggart with my perfume finds. I know “pride goes before a fall”. (sigh) Still I have to believe others out there are getting some great perfume deals but not commenting. You don’t come across as a braggart at all, to my perception. You’re rewarded so often because you’re always on the hunt, so to speak, and in the right neighborhoods (no brand-new suburban tracts)! It’s true that old neighborhoods–especially modest, old neighborhoods–have some of the best finds. No! If you were a collector, it might seem that way, but bc you seem both to appreciate your good fortune and to cherish what you find, it doesn’t come across that way in the least. I’m glad you see it that way. I really do enjoy them. Funny how in this thread we have hardly discussed the perfume. Instead, lots of other funny and sad memories and perceptions have emerged. No-one’s life is dull. You just have to have an eye for the significant detail. Lovely read, thanks Angela. I regret not buying the photograph, too. What was I thinking? Perfume in context to the details of the life. So much better than perfume in context of a mall (or designer or celebrity). So true! I’d rather buy a perfume associated with a mysterious photo at an estate sale than one associated with some minor celebrity. What will happen to all our perfume bottles when we go to perfume heaven? I make sure I wear something every day (unless I’m sick), just to use them all up. I hope my executor can sell my bottles and give the money to the SPCA. I inherited my childhood home which was a symphony of brown, yellow and orange, with horrific, plastic, geometric, hanging lamps to match. My husband and I have managed to get rid of the lamps and paint almost all the walls inside and out. I ripped off the wallpapers of brown, yellow and orange ferns in the hall, and egrets and lotuses in the bathroom. Ironically one lamp is now being sold at Ikea. A lady came from a downtown furniture store to assess the Danish Modern teak furniture which is in every room in the house! She reconditions and sells to the young upwardly mobiles that live in a now-chic, former warehouse district. Well, she offered me a mere pittance so I sent her away with only one chipped mirror and one small chair. Whew! I’m so glad I didn’t let her denude my home. She was salivating though. Now I realize the value of teak and the “in-ness” of mid-century furniture. The wall colours have been softened and the furniture is just fine but needs recovering, although I wonder about the wisdom of that. The stove was purchased by my dad for my mother when I was born 60 years ago. Most of it still works, I keep it clean, and the quaility is astounding. In Paris, there’s a restaurant called La Fermette Marbeuf 1900. Apparently, when this room was to be renovated, a workman put his pick axe through a wall that had been erected to protect the room during the war, he discovered the beauty of a fabulous art nouveau interior. I made a point of visiting it and was moved to tears. Even the bathrooms were tiled in mosaics of breathtaking beauty. And to think it was all almost lost forever. I wonder if Indiscret smells like Woodhue or Bellodgia. Your house sounds divine! I love Danish furniture. Thank goodness you didn’t lose it. I’m entranced by the story about La Fermette Marbeuf 1900, too, and am going to see if I can find photos as soon as I’ve posted this comment. Indiscret is more like Woodhue than Bellodgia, in my mind. 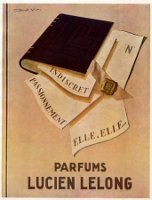 Angela-Congrats on your perfume find I received a Lucien Lelong coffret in a swap a long way back and have only given them a cursory sniff (they look really old and smelled a bit off)- but I will have to dig them out see what’s what. Thanks for the motivation! And more congrats on your kiwi dutch oven! wonderful! I have a hunter green (not a fan of the color) casserole buffet- i think it is- that I cook chicken and rice in all the time- LOVE it! Isn’t ridiculous how excited a person can get over what’s basically a cooking pot? I think this weekend I’ll braise some ox tails with grapes, a recipe from a Tamasin Day Lewis cookbook. 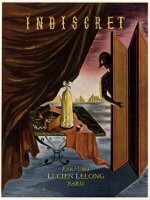 I was just curious if Lucien Lelong Indiscret smells as good as it used too. I was looking on the internet and ran into this site. My mother who just passed away, this last Sept. 2013, at 88 yrs. old loved Indiscret. Back in the mid 1940’s she worked at a very fine jewelry store R. W. Briney’s in Kokomo, Indiana. They made up there own bows for their gifts. The bows were sprayed with Indiscret. What a special way to wrap a special gift. And…a special way to remember a special mother. I hope the new Indiscret smells as good. What a wonderful story! Thank you for sharing it. It would be amazing to unwrap a gift with a handmade, Indiscret-sprayed bow. From what I’ve smelled, today’s Indiscret isn’t the exact heady, spicy fragrance of the old days, but they’re in the same family.